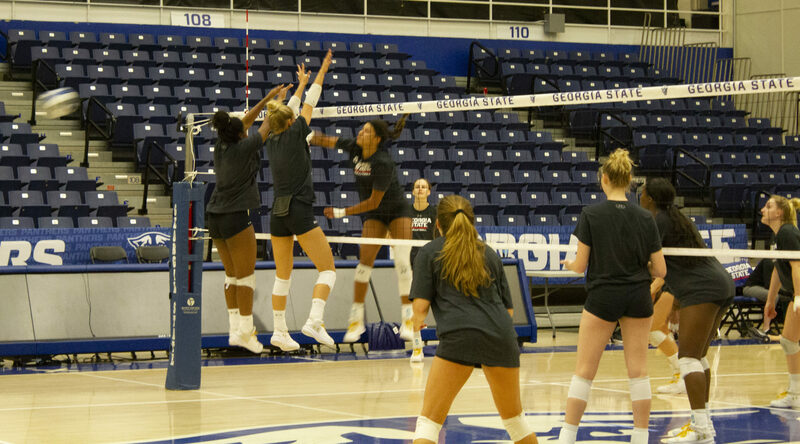 For the Georgia State volleyball team, the past seasons haven’t been so great in the win-lose column. The Panthers have yet to post a winning record since Georgia State kept tab of their record in the 2006-2007 season. It’s also been two years since the Panthers have reached the Sun Belt Conference tournament, which they last lost to Arkansas State 3-0. But, Georgia State started off the 2018 season well at the Starkvegas Classic, going 2-1 with wins against Mississippi Valley State and Mississippi State. However, the team was inconsistent in their following events. The Panthers went 0-3 in both the Rambler Challenge and the GSU Invitational, but they are fresh off a 3-1 win against Presbyterian. Head coach Sally Polhamus looked at the pre-conference events to “grow their systems” as they begin to face off against their Sun Belt Conference opponents. “We’re basically starting at 0-0 into the conference schedule,” Polhamus said, who believes the team makes errors that can be cleaned up. “When we play clean ball, we are a very strong team,” she said. Another key to the Panthers’ possible success is the leadership that upperclassmen display. The Panthers have five seniors on the team—Crystal Lee, Carley Eiken, Shae Chapman, Anna Rantala and Sarah Renner—and Polhamus believes they are a huge push for the team. “These five seniors are very special and can add something very valuable to the team,” Polhamus said. Sarah Renner, a senior from Cedar Rapids, Iowa, has had her fair share of individual greatness on the team. During the Starkvegas Classic, she became the ninth player in Georgia State history to reach 2,000 career assists. The senior setter credits her teammates for “making her look good” during the three games as she accomplished her huge milestone. Renner also believes that this season is the one for the Panthers to make some noise in their conference. “We’re looking to establish ourselves as a solid team in the Sun Belt and we’re looking for a championship season,” Renner said. She also believes her role as a senior on this young team is very important. “You’re showing everybody the standard you want to have in the gym and to set the tempo all the time with your talk and consistency,” she said. Things have not gone smoothly for the Panthers throughout the last decade, but their confidence is through the roof when talking about the possibilities this season. With a strong, experienced senior front and a head coach who believes in them firmly, they can finally look to become a good team in the Sun Belt and return to the Sun Belt tournament after a year-long hiatus. This year can be a turning point for the volleyball team, potentially laying the groundwork for future successes. The Panthers are also looking to potentially make their first NCAA Tournament appearance since 2000, where they lost to the second best team in the country that year, Southern California. Only time will tell for this young volleyball team.